Viste du at «Tom of Finland» egentlige navn er Tauko Laaksonen (født 1920 – død 1991), og at han var fra Finland? Lær mer om han ved å klikke her! Se hans gjesteforelesning ved «California Institute for the Arts» ved å klikke her. 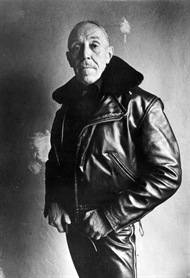 Did you know that “Tom of Finland” real name was Tauko Laaksonen (born in 1920- died in 1991) and he was from Finland? Learn more about him – click here. Watch his guest lecture at California Institute for the Arts – click here! ALLE VÅRE TOM OF FINLAND PRODUKTER ER OFFISIELLE LISENSIERTE PRODUKTER! ONLY OFFICIAL TOM OF FINLAND PRODUCT APPROVED BY THE TOM OF FINLAND FOUNDATION.